Written by admin on May 4th, 2015 April 20th, 2016 . 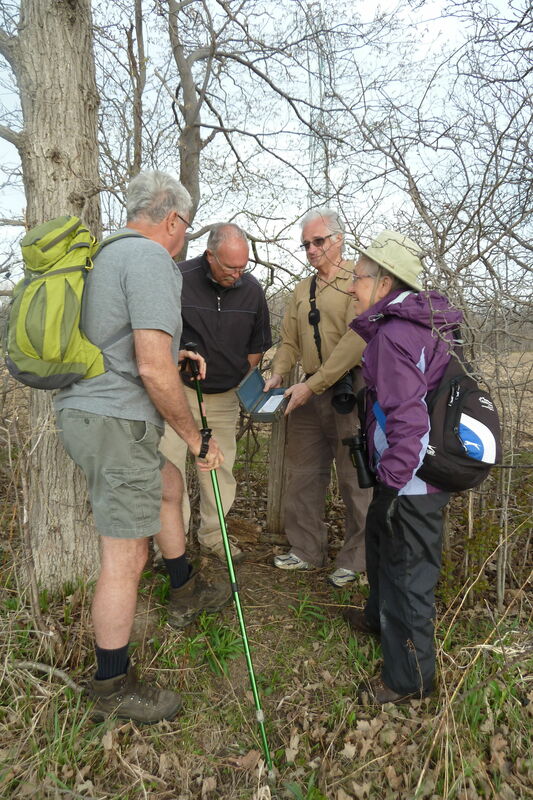 Mark showing a geocache to hikers from West Elgin Nature Club. Eight visitors from the West Elgin Nature Club with leader Marg Hulls joined four from our club to see if the bluebells were in bloom. It was a little early. The weather was great. Several other caches were found on the trail. The confusing routing west of the horse farm was viewed and a plan to fix up the ambiquity was devised. A safer route up to the hydro tower will need to be routed and blazed. Once this work is completed the red barn to the horse farm will be a nice trail for everyone to enjoy.